Good afternoon to all of you. Let me at the outset thank the organizers of this discussion for the chance to share with you our modest thought on the “Challenge of Gender and Sexuality in the Ecumenical Context”. I have been tasked by our General Secretary to participate in this discussion and to share with you the UCCP’s viewpoint on the issue. I am not sure what was running in the mind of our general secretary when he specifically thought of my name to represent the UCCP here. Galit kaya sa akin si GenSec o my duda sya sa sexual orientation ko? I must be very honest to tell you that it feels very uncomfortable on my part to talk about an issue that I feel am so incompetent of given my very limited discernment of such an enthralling concern. To tell you frankly, this is not my cup of tea. Given such as an excuse, let me share with you some thoughts based on our experiences in the UCCP. By definition or understanding, gender and sexuality do not simply refer to physical and biological make ups of persons. Although every person is generally born as either male or female. But as the children grow old, they begin to learn and in due course take on the concept that there are different roles for males and females and that they are expected to conform to such norms. While all are born with their intrinsic sexuality but it is actually through our cultural-religious upbringing that we are defined as women and men. This then is what we call gender identity. Hence, gender essentially refers to the construction of identity by our own society. It is this construction that defines for us what it means to be female and male. These roles assigned by our cultures seem so natural that we are tempted to believe that “that’s how it is supposed to be”. On the surface, this keeping of women and men in their place may seem fine and some of us can point to the advantages of the situation. One of the often cited advantages is that this system makes things easy, everyone knows their place and the rules which govern the relationship between women and men are clearly set out. However when the situation is examined through the eyes of gender sensitivity and equality we find that underneath the surface of this arrangement is a system that favors men to the detriment of women. It is a socio-cultural system that is characterized by inequality and injustice, where power belongs to men and the male child being valued more than the girl child. This male centeredness and rule by men is often referred to as patriarchy. Where there is inequality, there is injustice and injustice, as we have seen in many junctures of our history, which has to be confronted and overcome if there is to be justice and freedom for all. In a situation of inequality, women or “non-males” experience exclusion and marginalization as they are kept in the margins of society or marginalized as we prefer to say it. It is this exclusion that keeps the majority of women or “non-males” at the sidelines of society and leads to a situation where they are at the mercy of men. By heart, the UCCP upholds the equality of men and women as categorically expressed in our constitution (Article II, section 6) and in keeping with the biblical injunction in Galatians 3: 28. Consistent with such principle, we have, as early as 1998, elected our very first woman bishop in UCCP, in the person of the late Bishop Nelinda P. Briones who won by a wide margin of votes over other male candidates. To date, we still have another woman bishop who is now an emeritus in the person of Bishop Dulce Pia Rose, my batchmate in the episcopacy. These women church leaders have proven and demonstrated that if given the equal opportunity, women can also make a difference. We are happy to share that as a result of our efforts to open more opportunities for women’s participation in the total life-work of the church, a number of our conferences are now being led by women conference ministers, which concretely demonstrates our churches’ recognition of the equal role of women. 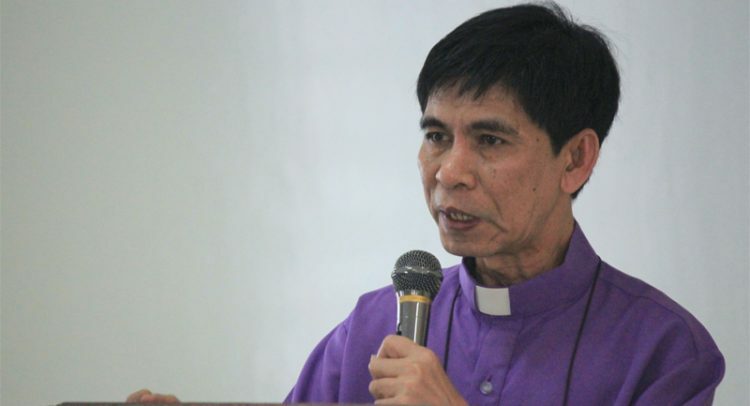 The most recent manifestation of UCCP’s concern for gender equality is the policy-statement adopted by our General Assembly in 2014 on LGBT (copies of which are available for distribution) Said policy-statement was welcomed positively by UCCP constituents based on recent reports coming from all incumbent bishops. In fact, there are ongoing study sessions in almost all levels of the church as a result of the adoption of such policy statement. About two or three weeks ago, a week-long training “Towards a Gender-just UCCP” was conducted involving women and men leaders from all over the country. So far this is where we are in the UCCP. The road perhaps towards a gender-just church remains far-off. But at least we have reached this far as of this point in time. The journey continues nonetheless. As a pastor I cannot resist referring to the Bible if only to drive an important point. Let me therefore make a critical re-reading of a biblical story narrated by Matthew concerning Jesus’ encounter with a Canaanite woman. And this is where, I believe, lies the challenge of gender and sexuality in the ecumenical context. We draw some lessons from the story of Jesus’ encounter with a Canaanite woman who sought Jesus’ help on behalf of her sick and possibly demon-possessed daughter. The Gospel of Matthew refers to her as a Syro-Phoenician woman, meaning, Greek and Gentile. Her ethnicity as a Canaanite meant that she was a descendant of the peoples who originally occupied the land of Canaan – the so-called “Promised Land” from where they were driven away by the conquering Israelites led by Joshua a thousand years earlier. That piece of history made the Jews and the Canaanites enemies for life. To be called Canaanite was to be considered godless, and hence, should be avoided by members of the Jewish community. Jesus and his disciples were making their way through this populous Gentile region of Tyre and Sidon looking for an isolated place in the countryside where he, in particular, could take a break from his tedious schedule. In Palestine where they came from not only was he followed by large crowds, each one of them wanted a piece of him, not to mention the fact that he was always the object of aggression from the Scribes and Pharisees who pursued him with hostile intentions. It was thus a most stressful week for Jesus even in a country of God-believing people. At the back of his mind spending time in a Gentile region would give him a sure respite from his daily labors. The Jews, after all, would not dare follow him in an enemy territory. Indeed, human need transcends the boundaries of ethnicity, gender or creed, for right in a Gentile world he had too little choice but listen to people’s hunger for social justice, provisions for food, the urgent needs of their physical health, and so on. That special day in a Gentile region, this mother was at the point of desperation in seeking every possible help for her ailing daughter. She must have exhausted all the traditional medicine available within her own culture, but nothing ever worked. In those days complicated sickness of all kinds were considered as the sure consequence of one’s sin or the handiwork of a demonic power. Her attempt to seek Jesus’ help, who was a Jew, must be a last ditched effort to save her dying daughter. This is a mother’s instinct at its best, simply doing everything and anything she could just to save her seriously ill child. It didn’t matter anymore if Jesus was a total stranger or an enemy of her own people, for as long as he could revive her dying child. She must have heard about this man Jesus having done some miraculous healing in the neighboring Jewish territories. She must have heard about the growing popularity of this man attracting hordes of followers to his cause for he preached with authority and power. At first, Jesus did not mind her at all, consciously aware that he was in a Gentile territory— an enemy of the Jews and known to be the home of unbelieving people. He simply ignored her as if he did not hear anything. His disciples, curious at the silence and inaction of their Master, took it as a signal for them to dismiss the woman’s pleading, so they urged her to leave the Master alone. Apparently, her repeated noise was too annoying to anyone who heard it. Matthew describes the words of the disciples saying, “she keeps shouting after us!” Ang kulit-kulit at nakakistorbo na! Unmoved, again Jesus spoke to her in a more condescending manner: “It is not fair to take the children’s food and throw it to the dogs!” This statement coming from Jesus himself seemed too distasteful and arrogant! When I was reading this part of the story, I could not believe Jesus uttered those words! His language not only excludes and rejects the woman, he was, in effect, insulting the whole Canaanite community. His first statement was an outright rejection of a woman begging for mercy. But the second was no less insulting, discourteous and rude! Comparing a Canaanite person to the dogs was a typical remark of ordinary Jews when referring to their ancestral enemies. So no language could be more insulting and offensive to the Canaanites. Here we see the obvious masculine inclination of biblical writers that even Jesus was portrayed like a macho man in this intriguing encounter with a gentile woman. But, for some reason, there was a sudden twist in the story. Something providential happened in that unpleasant conversation that changed the flow of the narrative. First, the woman persisted in her desire to move the heart of Jesus. She did not challenge him nor answered back Jesus’ insulting remarks. Instead, she simply appealed her case with a humble rejoinder: “Yes Lord, I may be a dog, yet even dogs eat crumbs that fall from their master’s table.” No doubt the Greek woman had the wit of a typical Greek citizen. With those lines, her persistence finally paid off. The words of the woman deeply impressed Jesus to which he gladly answered, “You are a woman of great faith. Let it be done for you as you wish!” Men and women of great faith need to work together to achieve their noble goals. From a Gentile unbelieving culture here is a woman who speaks her own mind about faith in a merciful God. It must have been a gesture of great courage to say those words to Jesus right in front of an unbelieving crowd—yet the woman did so unmindful of the culture of cynicism and disbelief that prevailed around her. Jesus saw the courage and the faith that brought this woman face to face with him. To Jesus her kind of faith was too unusual in a Gentile world to deserve outright dismissal. It was a test of faith and she passed the hard test. The message this narrative wishes to convey is such that even in the midst of an antagonistic atmosphere there is always a possibility for a determined action to come out boldly into expression. In a context of deep antagonism it is possible to pursue a noble ecumenical agenda such as gender justice and equality. Yes, it is possible to plant a seed of hope even in situations where even God is an unknown entity. This Canaanite woman must have been worshipping an unknown God for years, but did not experience Him until she met Jesus that day. This time she knew that God was not a mere hearsay but a reality that welcomes all persistently searching people. Somehow, the power of the Gospel is uncontainable even amidst an skeptical culture and doubting community. No Gentile territory in this world is too stubborn as to resist completely the strong union of people’s voice and aspirations. In my own reading of this story I discovered something about the virtue of persistence in our common search for justice and truth. As we see in the character of the Canaanite woman, persistence made it possible for her to finally get what she deserves. This also reminds us of another parable about a widow who repeatedly and persistently prayed to a judge to rule her case in her favor and she never stopped until the judge could no longer ignore her. At the end of the day, she finally got what she wanted. The fact that Jesus did not close the door for the Canaanite woman is enough challenge that the door of liberation is always open and accessible for those who untiringly struggle for dignity and freedom from unjust systems and structures. The ecumenical community must not waiver in its agenda for a truly gender just church and society.